Several slices of beef, vermicelli, soybean cakes, with green onions, chilies, garlics and finally a special seasoning ingredient. People usually have it with Shaobing. traditional Chinese street food similar to crepes. It is a type of bing generally eaten for breakfast and hailed as "one of China's most popular street breakfasts." 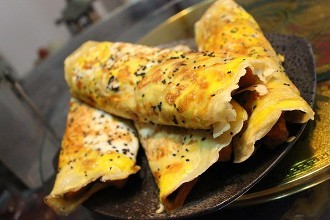 The main ingredients of jianbing are a batter of wheat and grain flour, eggs and sauces. It can be topped with different fillings and sauces such as buocui (crispy fried cracker), chopped or diced mustard pickles, scallions and coriander, chili sauce or hoisin sauce depending on personal preference. It is often folded several times before serving. 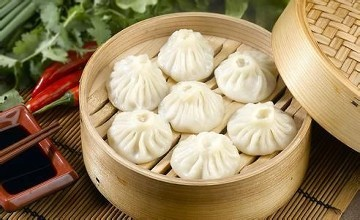 A type of Chinese steamed bun (baozi) from the Jiangnan region, especially associated with Shanghai and Wuxi. 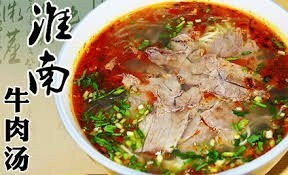 It is traditionally prepared in Xiaolong, which is a kind of small bamboo steaming basket, which give them their name.